Purple Moor Grass (Molinia caerulea) – here after called Molinia – has increased rather dramatically in recent times on Dartmoor and elsewhere in the British uplands. This blog attempts to answer why this has happened. Looking at Dartmoor (and indeed all the UK’s Uplands) today it is easy to forget that the rise to dominance of Molinia on the mires and blanket bogs is a recent phenomenon. 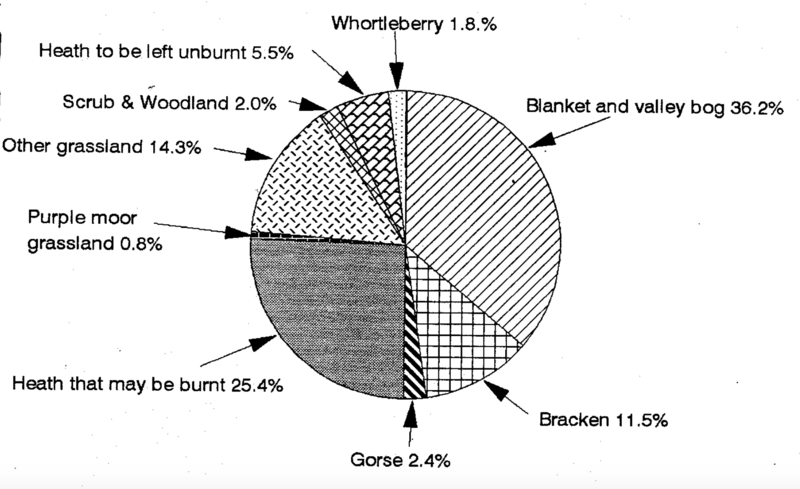 Wolton et al (1994) in their report on heather condition on Dartmoor based on fieldwork carried out in 1989/90 concluded that ‘Purple Moor Grass’ consisted of less than 1% of Dartmoor’s Commons i.e. less than 2,800 ha. 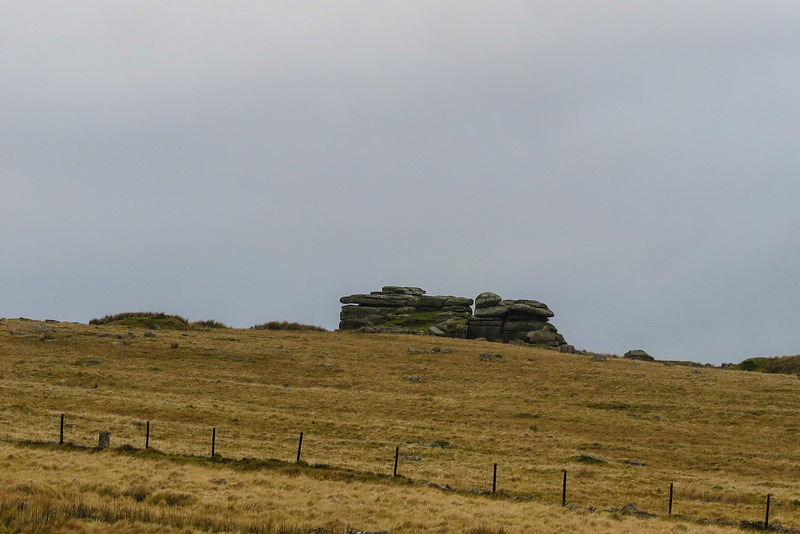 Although comparative figures are not available for Dartmoor today it is widely agreed that this figure has increased dramatically but an increase of 20x does not seem inappropriate in my view. Chambers et al (1999) showed from paleoecological research that the rise of Molinia is a recent phenomenon, this work also showed that the rise of Molinia was at the expense of heather communities. The spread of Molinia concerns farmers as this grass is relatively unpalatable to stock and it is of concern to conservationists as the ‘rafia’ fields of the grass produce monotonous species-poor landscapes which suppress other moorland species such as heather. The spread of Molinia was originally thought to be caused as a result of overgrazing and excessive burning. Averis et al (2004) suggest the following changes to National Vegetation Classification communities which can all lead to an increase in Molinia communities. The communities described below e.g. M25 Molinia caerulea-Potentilla erecta mire follow the NVC (Rodwell 1991). The original restoration management prescriptions from English Nature and Nature England focused on reducing the grazing pressure and reducing burning on the mires and forbidding it on the blanket bog. Whilst such prescriptions aided the blanket bog it was very much less successful at reducing the incidence of Molinia on the mires. Research was therefore conducted from the late 1990s onwards to determine how Molinia could be controlled. The seminal paper on this work is Marrs et al (2004) which concluded if Molinia was to be controlled in situations where it had become dominant (the so called ‘white moors’) then a combination of herbicide application, raking off the litter, soil disturbance and re-seeding with heather was required. This experimental approach was carried out in the Peak District and the Yorkshire Dales. Attempts have been made to mimic these experimental restoration prescriptions on moorlands in the north of England but they are expensive and have been carried out on a relatively small scale by conservation bodies using their own resources (Meade 2015). Such trials have yet to take place on Dartmoor. On Dartmoor the approach to managing Molinia has involved local swaling techniques which if followed up by intensive spring / summer cattle grazing can reduce the dominant of Molinia. However, if the burning is followed up by sheep grazing opposed to cattle grazing the Molinia tends to increase. Molinia is a fire adapted species which benefits from burning unless the initial spring growth is reduced via cattle grazing. Such a prescription has been hard to deliver on Dartmoor as there are either insufficient numbers of cattle available or they graze in areas which haven’t been burnt and ignore the new burnt areas. The role of aerial pollutants are also known to have impacts on vegetation in the uplands. The deleterious effect of sulphur dioxide emissions has been known for a long time in places such as the Peak District as a result of smokestack emissions which began with the Industrial Revolution. Action has been taken to reduce sulphur dioxide emissions and these have dropped dramatically since the 1970s (Caporn & Emmett 2009). More recently attention has been turned to the role that nitrogen and its compounds might have on upland plant communities. Brown & Farmer (1996) showed that between 1989-92 total (oxidised and reduced) nitrogen deposition exceeded critical loads on Dartmoor in 841km2 out of a total of 901.77 km2 i.e. 93.3% of the total – making it the second worst performing Natural Area in England. Caporn and Field (2015) report on research from the Netherlands where high levels of nitrogen were linked to the increasing cover of the competitive grasses Molinia and Deschampsia at the expense of heather Calluna vulgaris and Sphagnum species. They conclude their review by stating that ‘if nitrogen deposition has been a major factor in the spread of Molinia, this will be difficult to reverse since the deposited nitrogen accumulates in the soil-plant system’. Heal (2002) states that increased nitrogen deposition has led to heather growth being less vigorous and competitive when compared to grasses such as Molinia which tend to flourish better. Worryingly Des Thompson one of the UK most respected upland ecologists said ‘Some of us are beginning to form the view that some of the grass-dominated vegetation types of the southern uplands may be the product of nitrogen deposition and heavy grazing pressures. Hence, a reduction in grazing pressures alone may not necessarily result in an improvement in habitats’ (Thompson 2002). These problems may not just be associated with nitrogen levels. Caporn and Field (2015) state that whilst the evidence of increased nitrogen deposition supports the recent rise to dominance of Molinia both carbon dioxide (CO2) and ozone concentrations in the atmosphere are continuing to rise. CO2 levels have risen from around 320 ppm in 1960 to over 400 ppm in 2016 and show no signs of slowing down. Such an increase would be consistent ‘an immediate and significant stimulation of photosynthesis. There is very little knowledge to how Molinia responds to CO2 , but it is reasonable to speculate that the long term growth response will be increased when nitrogen availability is enhanced’. Ozone concentrations are normally higher in rural areas when compared to nearby urban areas. Wedlich et al (2012) showed than in upland meadows in the Pennines increased ozone concentrations did not affect grasses but did significantly reduce the flower (forb) community, thus favouring the grass species. The rise in the dominance of Molinia has had profound impacts on the biological diversity of Dartmoor, it also has a detrimental impact on the historic environment. Whilst the impact of aerial pollution has been well researched and whilst there is a good deal of circumstantial evidence to its role in promoting grasses such as Molinia to the detriment of heather, it would appear that basic moorland management prescriptions and the quest for ‘favourable condition’ (Natural England’s measure of success for the management of Sites of Special Scientific Interest) appear unmodified despite the increasing evidence to suggest that upland ecosystems may have been irreversibly modified. With almost any given topic there is a call for more research to clarify the complexities of a situation, in this instance the role of nitrogen deposition has been known for over a decade without an appropriate policy / management response. There is a great deal of evidence now available to suggest that a tipping point has been passed. The current management prescriptions involving reduced grazing pressures on the Commons to improve and encourage the condition for species such as heather may no longer be effective as a result of the increased levels of nitrogen, CO2 and ozone Is a fundamental new approach is needed and is ‘favourable condition’ any longer achievable? Unless this topic is tackled farmers and conservationists are likely to fail to improve the conditions of the Commons which both groups are so desperately trying to achieve. Averis A., Averis B., Birks J., Horsefield D., Thompson D. & Yeo M. (2004) An Illustrated Guide to British Upland Vegetation. Joint Nature Conservation Committee. Peterborough. Bonn A., Allott T., Hubacek K. & Stewart J. (2009) Drivers of Environmental Change in Uplands. Routledge. London. Brown M. & Farmer A. (1996) Excess sulphur and nitrogen deposition in England’s Natural Areas. English Nature Research Reports No. 201. Burt T.P., Thompson D.B.A. & Warburton J. (2002) The British Uplands: Dynamics of Change. Joint Nature Conservation Committee Report No. 319. Chambers F.M. Mauquoy D. & Todd P. (1999) Recent rise to dominance of Molinia caerulea in environmentally sensitive areas: new perspectives from paleo ecological data. Journal of Applied Ecology 36: 719-733. Marrs R.H., Phillips J.D.P., Todd P.A., Ghorbani J. & Le Duc M.G. (2004) Control of Molinia caerulea on upland moors. Journal of Applied Ecology 41:398-411. Payne R. J. (2014) The exposure of British Peatlands to nitrogen deposition 1900-2030. Mires and Peat volume 14, Article 04 pp1-9. Thompson D.B.A. (2002) The importance of nature conservation in the British uplands: nature conservation and land-use changes. In Burt et al (2002) p37. Wolton R.J., Edge S., Keddle R.M., Kendall S. & Archer R. (1994) Vegetation and Heather Condition Maps for the Commons of Dartmoor. A practical aid to their sensitive management. English Nature Report (unpublished). This entry was posted in Dartmoor and tagged Dartmoor, Molinia, Purple Moor Grass. Bookmark the permalink. O help! Not good at these biological names – trichophorum cepitosus – is this Deergrass, once trichophorum cespitosum (nothing to do with cess pits) and now trichophorum germanicum because t. cespitosum is used for something else? Very confusing – is it Deergrass? An interesting article, it’s odd that here in Sussex the opposite is the case – Molinia grassland is rare and is actually encouraged where possible – for example in the country park in which I volunteer we have done work to increase the area of Molinia in the park as the rangers say it is excellent habitat for small mammals, especially harvest mice and some specialist invertebrates. Funny then how the conservation status of a species changes so radically depending on where it occurs. Hi Elliot – sorry for the delay in replying. Molinia is a sunny plant – it grows in two distinct habitats – acid grasslands in the uplands and in calcareous fens in the lowlands – it is much valued as a species in fens and because of the way fens are managed it never seems to dominate and take over.